From a barbed-wire camp to a barbed-wire country, they made ... The Great Escape. Steve McQueen leads an all-star cast in this "stunning" (The Film Daily), action-packed classic about a group of Allied POWs who attempt one of the largest and most daring breakouts in history. Filled with "rip-roaring excitement" (Leonard Maltin) on the grandest scale, The Great Escape is one of the most ingenious and suspenseful films of all time! When we look at flicks that fit the concept of “Definitive Guy Movie”, 1963’s The Great Escape merits serious consideration for that title. After all, Steve McQueen stars in it, and he lands high on any list of movie-acting man’s men. And a flick about war prisoners who stage an escape? It doesn’t get more “Guy” than that. Set during World War II, Escape opens with the arrival of truckloads of Allied prisoners at a German maximum-security camp called Stalag Luft III. We quickly meet Senior British Officer Ramsey (James Donald) who acts as liaison between the prisoners and the Germans who run the joint. He confers with Colonel Von Luger (Hannes Messemer), the German head of the camp, who explains the nature of the place. We find out that Luft III confines only the craftiest of prisoners who present the most extreme risk of escape. From there we get to know some of these guys. The roster includes Virgil Hilts (McQueen), Bob Hendley (James Garner), Roger Bartlett (Richard Attenborough), Danny Velinski (Charles Bronson), Colin Blythe (Donald Pleasence) Louis Sedgwick (James Coburn), and “Piglet” Ives (Angus Lennie). The group quickly takes up the challenge to escape. Along with Ramsey, Bartlett grabs the lead and gathers a party to dig three tunnels out of the camp and address other necessary elements. He assigns them various roles based on their distinctive talents. That group includes most of the guys I already listed. In a different category we find Hilts and Ives, who attempt their own two-man escape through a small tunnel. Their initial effort fails and lands Hilts back in isolation, a place where he eventually spends so much time that he earns the appellation of the “Cooler King”. Those in charge of the big escape approve of his efforts mainly because they distract the Germans from their own task. After another stint in the cooler, the group tries to recruit Hilts for their purposes. They realize that if he escapes but intentionally gets captured, he can give them information about what lies beyond the landscape. He agrees and becomes part of their plan. 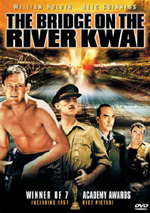 The rest of the film follows the progress of the escape and what happens to all the prisoners. From the start, Escape quickly sets a tone that lets us know what kind of movie to expect. Elmer Bernstein’s score helps establish the mood with the jaunty main theme. This tells us the film won’t exactly provide a dark and harsh examination of prison camp life; though it offers some emotional moments, Schindler’s List this ain’t. Nor should it be, but the film’s cheeky tone comes as something of a surprise given the darkness of some of its material. I don’t want to give away the ending, but don’t expect things to end happily. The movie works on its own terms and provides a positive swing of sorts, but it doesn’t follow the path I thought it would. Of course, Escape doesn’t have much leeway to give us a happy ending, since it comes based on a true story. The movie takes some liberties – mainly through the characters – but it remains surprisingly true to life in many ways, largely in that it doesn’t sugarcoat the conclusion. The flick could have altered things to give us a more upbeat finale but it doesn’t, and it definitely deserves credit for that. Although Escape presents more than a few moments of melodrama, it fails to become mired in excessive sappiness. The movie easily could have turned into a lame “triumph of the human spirit” experience, especially via the Hilts character, who demonstrates firm toughness and refuses to let the system capsize him. Happily, the movie keeps things from becoming goopy and syrupy, as it stays with a more matter of fact and somewhat glib tone that works for it. The cast help make it work. Coburn can’t pull of an Australian accent to save his life, but overall, the actors bring a lot to the table. McQueen seems particularly strong. He comes across as cocky and flippant but resolute as well, and he helps make Hilts a charismatic character despite limited screen time. Escape offers a surprisingly human portrait of some Germans as well. Von Luger comes across as quite full-blooded and real. The movie doesn’t soften him or turn him into a Colonel Klink style buffoon, and it doesn’t attempt to act as an apology for Nazi excesses either. Instead, it shows some mild compassion from the leader without problematic sappiness. A concluding sequence between Von Luger and Ramsey simply and effectively conveys these elements. Of course, no one goes to see Escape for those moments. We want tension and excitement, and the movie aptly displays those. Essentially the first two-thirds lead up and through the escape itself, while the final act shows what happens to the various escapees. Very little action ensues in the first two acts, but the film still moves pretty briskly and maintains our attention. The final third presents a nice level of action, especially via a motorcycle chase sequence. The pacing slightly lags at times, but not badly, and the movie presents a fairly lively piece. Overall, The Great Escape presents an involving and entertaining program. 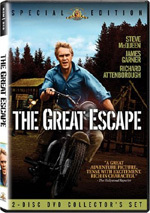 The Great Escape appears in an aspect ratio of approximately 2.35:1 on this single-sided, double-layered DVD; the image has been enhanced for 16X9 televisions. For the most part, the film looked quite positive, especially when one considered its age. Sharpness appeared very good. The movie mostly came across as nicely accurate and distinct. Some softness interfered with wider shots, largely due to the presence of moderate edge enhancement. The haloes were oppressive, but they seemed heavier and more distracting than I’d like. Jagged edges created no concerns, and I also noticed no problems with shimmering. As for print flaws, the image demonstrated sporadic examples of speckles and grits with a few small marks as well. These generally remained pretty modest, but they cropped up a little more often than I’d like. Colors presented some fairly good tones. The film offered a natural palette that tended toward a brownish tint to suit the dank prison camp setting, and the hues looked good. The colors came across as pretty concise and firm. Black levels also appeared dark and distinct, while shadow detail was appropriately heavy but not overly thick. Ultimately, The Great Escape demonstrated only a smattering of problems and it usually looked solid. The Dolby Digital 5.1 soundtrack of The Great Escape also worked well for its age. The soundfield demonstrated a fairly restricted presentation that essentially came across as broad mono. At times the material spread to the side channels, mainly due to the score. It demonstrated stereo imaging on an inconsistent basis; some parts seemed monaural, but others showed more distinctive stereo delineation. The same went for effects, as some elements popped up on the sides in appropriately localized spots, while much of the track remained pretty firmly anchored in the center. As for surround usage, the rears may have offered some light reinforcement, but that was it. I never noticed anything more prominent from the back speakers. Quality seemed a little more questionable but was usually good. Dialogue sounded iffiest, with a fair amount of variation. Although speech always appeared fairly intelligible, it displayed inconsistent quality. Some lines were natural and relatively warm, while others came across as somewhat stiff and thick. All lines remained within the realm of acceptability for such an old movie, however. Effects also sounded a bit flat and thin but they appeared reasonably clear, and the music was similar. In general, the audio was somewhat dense and a little heavy on low-end. Bass response occasionally came across as moderately heavy and boomy, though the low-end remained pretty decent for its age. Overall, the audio of Escape appeared good for something from 1963. In this two-DVD special edition of The Great Escape, we find a mix of extras. One disc one, we start with an audio commentary from director John Sturges, assistant director Robert Relyea, actors Donald Pleasence, James Garner, James Coburn, Jud Taylor and David McCallum, production designer Fernando Carrere, Steve McQueen’s manager Hilly Elkins, and motorcycle stuntman Bud Ekins. Author Steven Jay Rubin narrates the piece, which consists of his remarks plus many separate interviews edited into this whole. While some my dislike the non-screen-specific format, it doesn’t bother me, and this track presents a good breadth of material. We learn about the book’s path to the screen, Sturges’ interest in it and how he got onto the project, casting and the actors’ work together and relationships, locations, and various challenges. We get a lot of interesting anecdotes and encounter a nice feel for the production and the creation of the film. Rubin does a great job as master of ceremonies; he connects the various snippets well and provides plenty of facts of his own. In fact, his material really dominates, as the other comments pop up somewhat sporadically. The track moves briskly and presents a fine examination of matters. In addition, DVD One presents a trivia track. This presents a mix of factoids. We learn a lot about the real escape on which the film was based as well as general notes about the War. In addition, we find a variety of bits related to the movie itself, such as comments connected to the production, the locations, the sets, and the cast. The main focus remains on the facts behind the film, and these elements add a lot to our understanding of the story. It’s a fairly informative and entertaining compilation. As we head to DVD Two, we launch with a collection of eight separate featurettes. The first four really act as one larger program, and all of them come narrated by Burt Reynolds. These include Bringing Fact to Fiction (12 minutes, 15 seconds), Preparations for Freedom (19:40), The Flight to Freedom (9:15), and A Standing Ovation (5:50). The featurettes use the standard combination of movie snippets, archival materials, and interviews. We hear from Stalag Luft III ex-POWs John Weir, Alex Cassie, Albert Wallace, and James J. Cullen, wife of ex-POW Betty Floody, authors Jonathan Vance and Arthur Durand, and assistant director Robert Relyea. 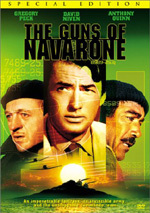 We learn about the origins of the tale and its path to the screen, adapting the historical tale and characters, the sets and locations, the realities of the actual prison camp and the escape, the elements of the individual flights and liberties taken, the prosecution of those responsible for some of the story’s atrocities, and the film’s reception. While the featurettes give us a decent look at some parts of the filmmaking process, the elements connected to the real story offer the best elements. We get a good look at what actually happened and the change made for the movie. The featurettes could use a little more depth, but they provide a pretty concise and efficient look at the material. Next we find a documentary entitled The Great Escape: The Untold Story. It runs 50 minutes and 35 seconds as it uses dramatic re-enactments along with interviews. We discover comments from former prisoners Jimmy James, Alex Cassie, Jack Lyon, and Les Brodrick, and former prisoner relatives Beryl Fitch and Colin Kirby-Green. The program focuses on the actual escape and skips the preparations that led to it. We get to know a little about some of the men and learn of many details related to the escape, the individual attempts to get out of Germany, and the aftermath. The re-enactments seem a little silly at times and don’t add much, but the material itself offers a lot of good information. The former prisoners provide nice notes and give us a fine examination of the specifics. We follow this with additional interviews shot for “The Untold Story”. This compilation fills nine minutes, 35 seconds, and includes remarks from Cassie and James. We learn about some specifics of their personal tales, the story of one of the three escapees to succeed, and what happened to the survivors after the war. We also get a list of the 50 murdered escapees. This is a minor program but one with a few interesting details. After this we discover a program called The Real Virgil Hilts: A Man Called Jones. It uses 25 minutes to combine historical materials, movie clips and interviews as it lets us know about David Jones, the inspiration for the Hilts character. After a short intro from James Coburn, we hear exclusively from Jones himself, as he tells us about his early life, actions in WWII, the escape and his role, his remaining time in the War and his post-War experiences. Jones offers a relentless barrage of interesting stories, as he proves to be a lively and entertaining speaker. This featurette gives us an informative look at the person behind one of the film’s key characters, and it’s a solid extra for this DVD. Finally, the “Featurettes” domain ends with Return to The Great Escape. In this piece, we find movie snippets, a few archival pieces, and interviews. The latter include David McCallum, John Sturges, James Coburn, Donald Pleasence, James Garner, Jud Taylor, Robert Relyea, art director Fernando Carrere, Steve McQueen’s ex-wife Neile McQueen Toffel and son Chad, and motorcycle stuntman Bud Ekins. ”Return” offers a basic examination of the production. We learn a little about its path to the screen as well as casting, locations, sets, and the shoot. Much of this information appears elsewhere, and not a lot of unique notes pop up here. We do find a better than average look at McQueen’s work on the film, though. “Return” is a decent program, but it feels somewhat redundant after all the prior pieces. Inside the Photo Gallery, we get 13 smaller domains. All together, these include 114 pictures. These mostly present stills from the set, though we get a few posters as well. In addition to the pictures, we often get captions and information that make this section more useful. In addition to the film’s trailer, we find a collection of ads entitled Other Great MGM Releases. This gives us promos for The Good, the Bad and the Ugly, Escape from New York and Windtalkers plus a general ad called “MGM Means Great Movies”. The package also includes a nice little booklet. The eight-page text presents some basic production notes. You’ll not find anything revelatory, but it’s a decent addition. A very entertaining movie, The Great Escape doesn’t come without flaws, but its problems seem greatly outweighed by its positives. The film tells an intriguing story in a lively and involving manner. The DVD offers pretty solid picture and audio plus a very worthwhile roster of extras. This fine package merits your attention.